No Comments. Join the Discussion. This fall, one of our partners, FactoryAudits.com exhibited at one of the largest trade shows in Asia, the Global Sources – China Sourcing Fair in Hong Kong. FactoryAudits.com specializes in product inspections and Factory Audits to help customers ensure product quality, secure imports and save time and money. FactoryAudits.com was proud to be one of nearly 7,500 exhibitors who spent the month of October networking with more than 62,000 buyers, a record amount of attendees for the Hong Kong show. The fourteen shows were held concurrently at the Asia World-Expo in Hong Kong and attracted some of the world’s top companies – such as Best Buy, Samsung, Levi’s, Office Depot, Toys “R” Us and more. If you are interested in learning more about their product inspection & factory auditing services please click here. The federal municipality of Tianjin, China is located an hour and a half outside of Beijing, on the coast of the Bohai Bay. Its prime location has attracted many of the world’s top enterprises including Motorola, Toyota, Samsung, Nestle, and LG. 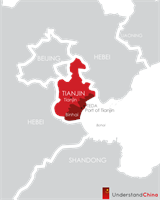 As the fourth largest port in mainland China, Tianjin is a regional hub for shipping and logistics industries, both of which are supported by its close proximity to the national capital, Beijing. Leading industries in Tianjin include mobile phone, aerospace, alternative energy, and automotive production. In addition to Tianjin, Understand-China.com includes many detailed investment guides for the top manufacturing regions. Ready to Explore? Start Now! It’s Free! 1ChinaBlog is pleased to announce the new and improved Understand-China.com. Through extensive research, the website has been refreshed and updated to provides the most comprehensive and up-to-date information available for businesses and investors looking to do business in the China. Understand-China’s vast network now contains over 250 pages of information with additional features and has taken more than 300 hours and 6 weeks to update. Understand-China continues to be the only one-stop-shop website providing concise and relevant information for companies looking to do business in China, invest in the Chinese marketplace, set up greenfield operations in one of China’s industrial regions, or understand the Chinese manufacturing industry. Updates include new data for the 24 top regions including statistics for each of their Foreign Direct Investments (FDI), Gross Domestic Products (GDP), Logistical Data, Real Estate information, Industrial Expenses, Labor Costs and various other categories of data. For several excellent examples of updated data, please view the provincial profiles of Beijing, Shanghai, Shenzhen, Tianjin, Hong Kong. Understand-China also includes twenty other provinces, special economic zones and Chinese special administrative regions. Please let us know what you think of the update! Tags: china guides, china investment, China manufacturing, understand-china.com. The 2011 Spring Canton fair came to a close yesterday, May 5th. This year’s import and export fair is considered a monumental session in the event’s 50 year history. Held each year, in Spring and Autumn, businesspeople from all over the world pour their way through the 55 million square meter facility over the course of the 15 day event in Guangzhou. The deals transacted from this session totaled more than 36 billion U.S. dollars, up 5.8% from last year’s Spring session. The fair attracted a record number of foreign traders as well; more than 207,000 foreign traders from more than 150 countries passed through the fair this year. Although there were fears of this year’s numbers being down due to the economic conditions, business transactions this Spring were very much so on the rise. The amount of exports with some of the big players rose quite a bit this year. Buyers from the United States entered into 12.4 percent more deals than last spring. European buyers also increased their transactions by 14 percent. Even more impressive than that are the number of deals enacted with the emerging markets of Brazil and Russia, that rose 30 percent this year. Other countries however saw a decrease in transactions for various reasons. Reports have indicated that trade dropped by 19 percent with Japan due to the various reasons associated with the recent disasters. Overall, the largest trade fair in China was another giant success. If anyone has any stories or pictures from this Spring’s show, we would love to see them! Tags: Canton Fair, canton fair results, canton fair review, china fair, china trade shows, Guangzhou, import and export fair, Spring canton fair. Have you finished planning your trip to this year’s Spring Canton Fair yet? The world’s largest international trade show is almost underway. As always, the Import and Export Fair will be held in Guangzhou, the center of China’s trade region China Import and Export Complex. The fair features over 50,000 exhibits spans over two weeks. Additionally, the China International Furniture Fair (CIFF) will be held in conjunction with Phase I and Phase II. Everything from modern home furniture to office and laboratory furniture will be available. Home Furniture will be on display from March 18 to the 21st and office furniture will be available from March 27 to March 30th. If you haven’t signed up yet, don’t worry there is still time. You need to apply for an “invitation” through the Fair’s website here. Admission is free, but registration typically takes about a week to get your confirmation. Once you receive confirmation, print out the information and take it with you along with a photo ID and a passport photo (or you may take one there). Spring Canton Fair Location: No. 380, Yuejiang Zhong Road, Guangzhou, China. Please do not hesitate to post any questions, comments or advice for future fair adventurers below. Tags: Canton Fair, canton fair dates, canton fair details, China Canton Fair, China Import and Export Fair, Spring canton fair. Despite fears that China’s efforts to decrease inflation would decrease economic growth, the production numbers still indicate a rise in China Manufacturing this March. March’s Purchasing Manager’s Index (PMI) rose from 52.2 in February, to 53.4 in March. According to economists, China’s central bank will increase interest rates again this quarter to further curb inflation. Some argue that this will eventually hurt China’s overall economy in addition to slowing the growth, but only time can tell. The manufacturing sector in the United States also grew this past March. It was the 20th consecutive month for manufacturing growth. In fact, it was also the 22nd consecutive month for overall economy growth as well. The PMI for March was 61.4 percent, which is down from February’s 61.4 percent, but any number above 50 indicates growth. The economy also grew by 3.1 percent during the last quarter of 2010. Tags: china economy, China manufacturing, china production, PMI, U.S. manufacturing, US manufacturing growth. Last month, China’s newest Five Year Plan (FYP) was developed at the Annual Sessions of China’s National People’s Congress. At the center of the 12th FYP is possibly their most ambitious energy goal to date. The new plan calls for a reduction of energy intensity by 16 percent over the next five years. As the goal is quite bold, it is possible considering that during the previous FYP, China managed to reduce energy by 20 percent. Other goals of the FYP include a plan to reduce pollution and reduce China’s dependency on fossil fuels. China is aiming to reduce carbon dioxide emissions by 17 percent and to increase the use of non-fossil fuels from 8 percent (current state) to 11.4 percent in 5 years. When it comes to implementation, China has decided to encourage development and foreign investment in industries that will increase their ability to move towards these green goals. They will be executing programs to support growth in the high-end manufacturing industries such as clean energy, various service industries and environmental protection. Of course, there are supporters and opponents of the newest FYP. Supporters of the plan include environmental protection groups and clean energy groups who are encouraged by China’s step towards a greener country. Some opponents say however, that the plan could be too ambitious and that some of the other goals included in the plan may be conflicting with their green initiatives; such as the target to build upwards of 40 new airports over the next five years. Ambitious or not, achievable or not, changes are on their way for foreign investors and where different incentives will be placed in the upcoming years. Tags: China Energy, china energy goals, china five year plan, china investment, china's new energy goals, china's new plan, five year plan. We found this very useful FDA interview on the provisions applied to importers under of the Food Safety Modernization Act. David Elder, the Director of Regional Operations from the FDA, covers the steps being taken for implementation. 15 percent of food consumed in the United States is imported. Importers must verify that their suppliers are conforming with the FDA’s standards. Import Verification Guidance documents must be published by the FDA by January 2012. The FDA must have an Accreditation System in place by January 2013. Comments from industry professionals will be allowed as new provisions are posted. Products and suppliers that not not pass FDA inspection can be refused entry into the U.S.
Manufacturers and importers must move forward with this information and start making decisions. -Importers will be in the process of setting up their verification system, but the exact rules and requirements of certification are in progress. -Businesses in the food industry are urged to start thinking about what this means for them and begin preparing for more strict inspections and regulations. Q: Why do I need to act now if it will take the FDA a few years to write any new rules? A: Reviewing your company’s food-safety, record-keeping and product-tracking procedures can lead to performance improvements and innovation. By being in the forefront of efforts to improve food safety and providing credible information to regulators and consumers, companies can not only get a leg up on the competition, but begin marketing their food safety practices to the public. Within one and a half years, all registered facilities will be required to conduct a hazard analysis, implement preventive controls and develop a food safety plan to document the monitoring, correction, and verification of preventive controls. The food safety plan and all related documents must be made available to FDA during inspections. As part of its food safety plan, a facility may be required to document sanitation procedures, a recall plan, a food allergen control program, supplier verification activities, and environmental sampling testing. Plans such as these take time to create and implement; it is never too early to be safe. In preparation for the FDA audits, our partner company FactoryAudits.com offers comprehensive Food Safety Assessments that analyze your facilities’ HACCP plan implementation, chemical control processes, pest control processes, sanitation risks and hazards and much more. Keep checking back with us as we will continue to post about the progression of this Act. Tags: food safety, food safety and haccp, food safety and supply chains, food safety modernization act, fsma, haccp, haccp certification. Mike McSweeney leads the 1ChinaBlog team. A California native, Mike was educated in Australia, the US, and China, is conversational in Mandarin Chinese, and leads the Global Supply Chain Practice for TriVista, a management consulting firm located in California and China.